End of Line Clearance! Be Quick – only a few remain. 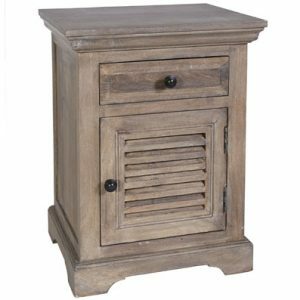 Create a modern industrial or exotic tribal space with the Zander Sideboard in Graphite. Beautiful and practical with 2 doors and 3 drawers. 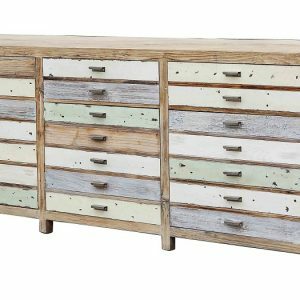 This beautiful sideboard will make an eye catching statement in your home! 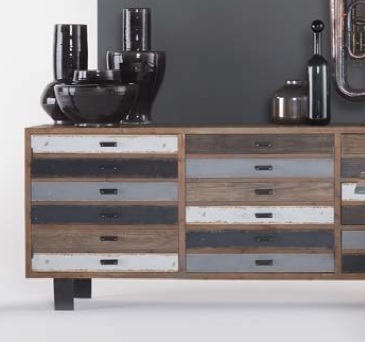 With the appearance of aged painted timber, the Zander Sideboard in Graphite will sit comfortably with modern industrial pieces or set the stage for an exotic tribal affair. 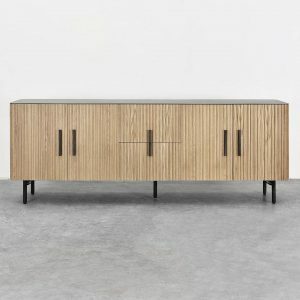 Cleverly concealing 2 doors and 3 drawers down one side, this piece is both beautiful and extremely practical. 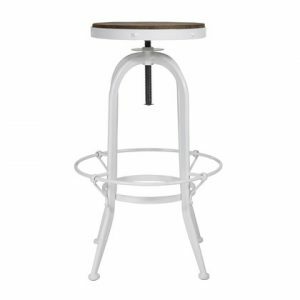 Graphite – made from recycled elm with black metal legs and an aged painted finish in black, light grey and off-white tones. Note: Each piece is unique and colours may vary from the image shown. We deliver Australia wide so call us for a freight quote today!